Most people have probably never sat around and meditated deeply on the origin of potato chip flavor. But if you really begin to think about it, most of what we perceive as flavor is not mouth-derived but actually due to your sense of smell. 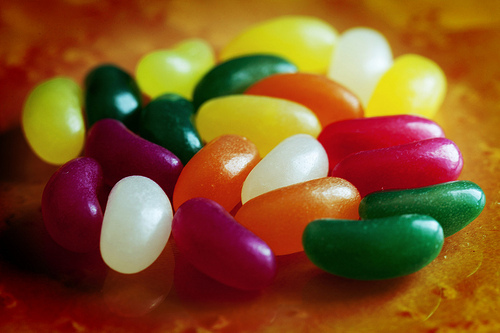 The Jelly Bean Experiment is a clever DIY test to help illustrate this point. All you need is a friend and a bag of jelly beans. Now close your eyes and have your friend select a bean for you. See if you can detect the flavor. Do this with a few different kinds of beans. Once you’ve established that you have a sense of taste (it’s not a test to see if you can become the next connoisseur of jelly beans, just that you can tell two flavors apart), with your eyes still closed, pinch your nose and have your friend hand you another bean. Can you tell what flavor it is? Probably not. You can most likely detect sweetness but your ability to distinguish the flavor of the bean is gone. Distinguishing flavors is a common issue for people with anosmia, or the inability to smell. While great for the smellier parts of life, like gym socks or baby diapers, anosmia makes detecting the subtle nuances of sage, basil, and oregano in Grandma’s homemade pasta sauce a hopeless endeavor. Without smell, it’s not going to happen. Reduced sniffer capability is also partially responsible for airline food being so troublingly tasteless. Fellow science writer Jordan Gaines Lewis wrote a great piece on many of the reasons why airline food is unpleasant with some fault laying with your olfactory (smell) system – Check it out HERE! Retronasal smell through exhaling air. Shepherd, Nature 2006. Let’s say that you’re in the laundry room trying to decide if a sock needs washed. When you breathe in the essence of the sock through your nose (hopefully its essence is spring rain, not dirty shoe), you are using orthonasal stimulation. However, there is a second smell pathway that allows you to detect scents from inside your body, referred to as retronasal stimulation. This sounds gross but is the process that actually occurs when you are chewing food and exhale. In either direction, orthonasal or retronsal, odor molecules come in contact specialized tissue in the nasal cavity called the olfactory epithelium. The neurons within the olfactory epithelium are activated and send signals to the olfactory bulb. Here’s where things get kind of crazy. Each smell, or odor molecule, has a unique chemical structure that results in a unique neuronal activity pattern in the olfactory bulb. When imaging how different chemicals affected the olfactory bulb in a mouse, researchers found that by just adding one carbon atom to a molecule, the ‘odor image’ on the bulb changed, meaning each smell showed a distinctive pattern of activation. Because the olfactory system can distinguish between single-carbon differences it is one of the finest molecular discriminators in the nervous system! 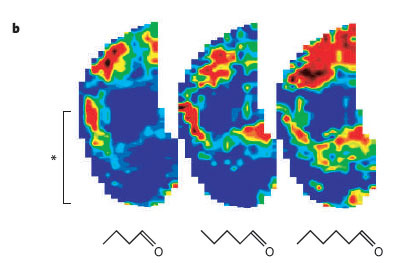 Heat map of olfactory bulb activation in response to different odor molecules. changes the activation response. They only differ by number of carbon atoms! Once the olfactory bulb is activated, the neurons in the bulb send signals up through several brain regions continuing to the olfactory cortex, located in the orbitofrontal cortex. The orbitofrontal cortex is a common meeting ground in the brain where several different brain sensory modalities converge. It is through these multi-sensory inputs that the experience of taste is created. So returning to the wonderment that is the potato chip eating experience – how is flavor being created in the brain? By just opening the bag of chips you’re visual system kicks it into high gear, mobilizing your gut as you begin to anticipate the food and salivate. Once the chip is in your mouth, taste, auditory, and motor systems are triggered as you begin to audibly crunch up the snack. Retronasal smell impacts your olfactory system as you chew and breathe. The brain is integrating all of these sensory factors and assembling the sour cream and onion flavor you have come to know, love, and savor. 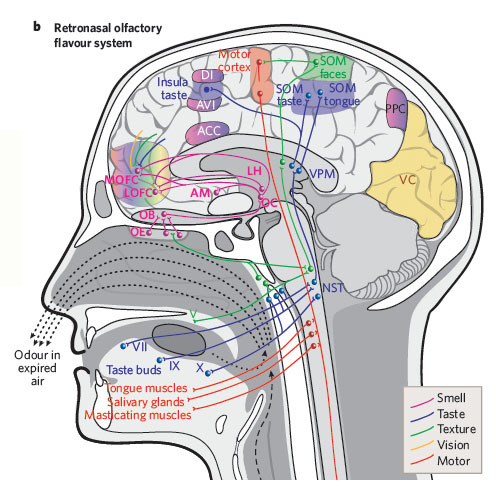 While smell is likely one of the dominant sensory modalities in flavor creation, the visual system has also been shown to play a critical role. One study asked both novice and experienced wine testers to classify red and white wines by taste. The trick was that researchers colored some of the white wine with a red dye. They found that people classified wines by color rather than by taste showing, at least in this scenario, that the information from the visual system was able to override olfactory information in determination of taste. To learn more about the “human brain flavor system” check out the book Neurogastronomy: How the Brain Creates Flavor and Why It Matters by Gordon M. Shepherd, Yale neuroscientist and head honcho in this field.